Congratulations on purchasing a new dress model. Your sewing adventure is about to begin! 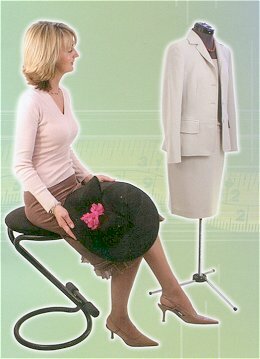 Keep your model next to your sewing machine, ironing board, Adjustoform sewing machine storage table or in your bedroom. It's sure to make your sewing experience more enjoyable and will help you achieve professional-looking results. The bullet points below are examples of the many ways in which a dress model is invaluable in garment making, whether you sew for yourself or others. 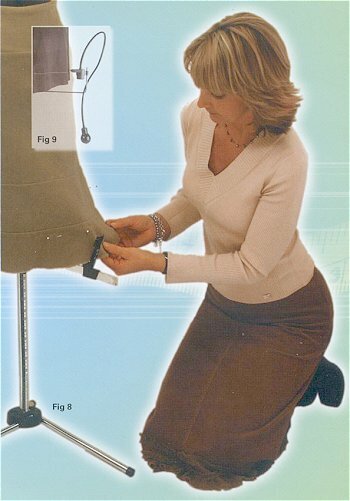 Whether you are a beginner or a professional dressmaker you will become quite attached to your new sewing assistant! Read these hints in conjunction with the assembly leaflet supplied with your dressmaking model. Check the drape of fabric. Is it suitable for the pattern you have selected? Style an outfit by draping co-ordinating fabrics together, to see how they would look for, say, a jacket and blouse. Check the placement of darts, pockets and buttonholes. Establish the position of collars and lapels. Position lace, trims, ribbons and appliqués on garments. Check or plan the placement for machine embroidery designs. Pin sleeves in position, based on your shoulder length. Tack in place, then machine stitch. Check the placement of shoulder pads. Check the ease and hang of a lining. Fit and hang wedding gowns as you sew. Fit trousers/pants - Some models are now available for fitting trousers/pants. The stand has been moved off-centre, and the hip and torso areas have been shaped to help achieve a professional fit. Before you begin to adjust the model to specific measurements, expand the body by loosening all the adjusters evenly, in small increments at a time. We suggest you make the adjustments, working from the hip level adjusters, upwards. This will release any tension on the body and will make subsequent adjustments smoother. It will also help you to familiarise yourself with the operation of the adjusters. 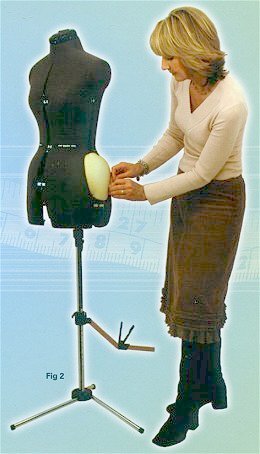 Identify the system on your dress model for adjusting the measurements at bust, waist and hips. It will be one of the two shown (Figs 4 and 5). 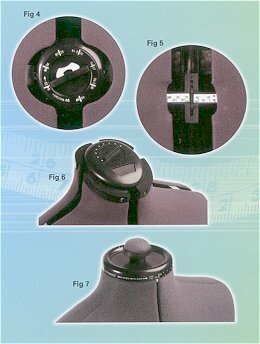 Identify the neck design for your dress model from the necks shown (Fig 6 and 7). In Fig 7, slightly unscrew the Pin Cushion and turn the Top Cap in a clockwise direction until the size required registers with the marker at the front of the model. Retighten the Pin Cushion. If your dress model is a Junior size, adjust the neck slightly, loosen the top knob and move the sections equally to the size required. Retighten the knob firmly. After making each adjustment always use a tape measure to check that the measurements are accurate. A professional looking garment enhances your total fashion image and is as much the result of a proper fit as it is of careful construction. An accurate set of body measurements is essential to adjust your new dress model to as close a copy of your body as possible. Ask someone to help you in checking and recording your basic body measurements. When measuring, pull the tape snugly, but not too tightly, around the fullest part of each body area being measured. Hips Measure around fullest part - usually 17.7cm - 22.8cm (7" - 9") below waist. Make a note of the distance between waist and hips. 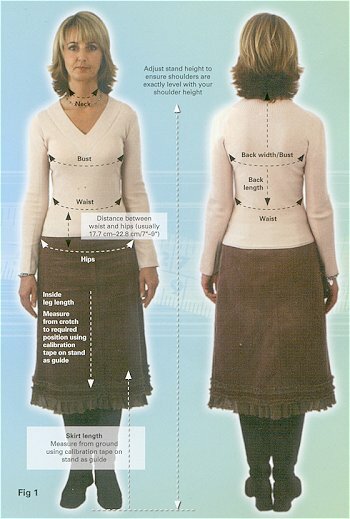 Skirt length Measure from floor (wearing shoes with appropriate height heel) to your required skirt length. 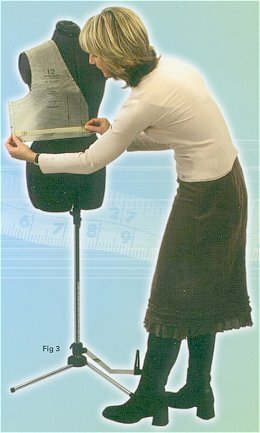 On dress model, use calibration tape on stand, which gives measurements from ground upwards. Wear only your usual underwear when taking your body measurements. Hips and Bust - Use polyester batting, cotton wool, or foam to pad out certain areas. (See Fig 2). Then cover areas with a thin bias cut fabric and pin or tape in place. Tip - For the bust, fit your own comfortable bra onto the dress model and use padding to fill out the cups. Use measuring tape, and add padding, until correct measurement is achieved. Filling in the Gaps - If you have made widening adjustments to the model, attach a strip of wide tape or ribbon to fill in the open areas. A pencil or stitching line can be added to the centre of the ribbon to identify the centre front, for example. Cover - If you wish, you could make a pullover cover for your dress model to hide any padding you have added. Use a material that will easily stretch over the body. Alternatively, cover padded areas with thin, bias cut fabric in a matching colour, and pin to model. Tip - When making a dress, buy the pattern size to fit your bust measurement, as it is easier to alter waist and hip measurements later than to alter the bust line. When choosing a skirt or trouser/pants pattern, buy the size to fit your hip measurement, as waist size can be more easily altered than the hip - particularly for fitted skirts. Tip - When you have selected the pattern pieces needed, iron each one with a warm iron to flatten each piece and remove any fold lines. Prepare the pattern by reading the instructions, and then check each piece by pinning onto the adjusted dress model. Make any alterations necessary to personalise the pattern to your body e.g. lengthen or shortening the waist. (See Fig 3). It will also give you an opportunity to identify pattern guides - notches, dots and lines marking folds, pleats, position of buttons, pockets, etc. Tip - Patterns allow for ease of body movement in garments, so be careful not to fit too tightly at any stage in making up. If possible, decide on the finished length of the garment before purchasing the fabric. If the required length is shorter than the pattern suggests you may be able to save on fabric, or you may need more fabric if your finished garment is to be longer than the pattern indicates. Check the length of other garments in your wardrobe. This will help you determine the fashion look you want. When purchasing your fabric be aware of its care instructions - dry clean or wash - and make a note for future reference. Drape the fabric over the dress model to check how it hangs in both directions. This will allow you to see whether the nap looks the same, regardless of the direction in which the fabric hangs. For velvet and some other fabrics, it is important to cut the fabric so that the pieces will hang in the same direction to avoid shading differences. Press the fabric to remove folds and creases, and check for any imperfections that you need to avoid when cutting around the pattern pieces. Lay out the fabric and pin on the pattern pieces. Double check that everything is correctly positioned and then cut out all the required pieces. An Adjustoform sewing machine storage table or any reasonable size table will be helpful for this operation. After cutting out your pattern and fabric pieces, you are ready to begin sewing. Tip - Use your dress model constantly to check the fit of your garment as you sew. This makes sewing so much easier than having constantly to undress and dress in order to try the garment on, in front of a mirror, where trying to see your own back is particularly difficult. Pin together the main body of the garment and place onto the model. Make any necessary alterations - e.g. position and shape of neckline and armholes, or positioning gathers so they are evenly placed. Remove the section from the model and tack along the pin line prior to machining and pressing. Tip - During the various stages of assembly, store the garment pieces in position on the dress model to keep them crease free and tidy, ready for continuing the work at an appropriate time. This is particularly useful if you do not have the benefit of a sewing room and need to 'hide' the partly finished garment from view e.g. when visitors arrive. Cover with a plastic bag to keep free from dust. This is a much more satisfactory solution than storing your partly completed garment in a bag and having to press the pieces before you can resume sewing. Tip - Your dress model will prove invaluable for checking that lapels and collars sit properly; that sleeves hang correctly; and for positioning pockets. Stand back from the model to double check that the look is satisfactory. Tip - Leave the garment on the model overnight to give the fabric a chance to drop before you take up the hem, using the hem gauge. If your dress model has a hem attachment, use it to achieve a perfect hemline. Tip - If skirt has been made from bias cut fabric, attach clothes pegs at intervals around the hemline to assist it to drop evenly. There are two types of Hem Marker, as shown in Figs 8 and 9. Both are very easy to use, but one requires pins and the other chalk to mark the hemline. Their individual methods of operation are described below. With the hem bar in the horizontal position, loosen the clamp and position the marker at the desired height, using the measuring scale on the post (from floor level), and lock in position. To mark a hem, place fabric between the plastic clamp, close clamp and insert a pin through the slot near the top of the clamp. Open clamp and repeat exercise at intervals of approximately 5cm around the hem. The calibrations on the gauge can be used to mark the depth of the hem allowance. Loosen the clamp and position the marker at the desired height, using the measuring scale on the post, and lock in position. Fill the reservoir at the bottom of the chalk ejector with chalk powder from the sachet provided, and replace cap firmly. Position the metal slide so that the spray nozzle is very close to or just touching the garment. Pressing the bulb, and then moving the marker 10 cm at a time round the garment and pressing the bulb again, will apply a fine line of chalk to create a level hemline, ready for pinning and sewing. Alternatively, turn the chalk ejector 180 degrees so that the Hem Marker can be used to mark a garment you are wearing. Ask your stockist for replacement chalk sachets. Tip - Use your dress model and hem attachment for bought garments to avoid paying for the alteration/repair. A dress model is your best friend when it comes to lining a garment. Follow the pattern instruction to cut, assemble and sew the lining and turn it inside out. Place it on your dress model, over the garment to be lined. Position it correctly and pin and tack carefully. Remove garment from the model, with lining attached, turn to right side out and replace on model. You will be able to check that the lining is not pulling anywhere, and that it cannot be seen at hemline, cuffs or neck. Turn the garment inside out again and carefully hand sew the lining to the garment. Tip - When your garment is complete put it on your dress model and experiment with scarves, jewellery, blouses, and belts to co-ordinate the outfit. This can be extremely helpful in judging how colours and designs work together. Tip - Use your dress model like a valet! For a special occasion, select your complete outfit and accessories. Press the garment if necessary and place it carefully on your dress model until needed. Tip - Use the model for day to day clothes' care. Put a garment on the model and brush, sponge, steam or press then hang to set. Tip - Use the dress model to store and display an item of particular interest - wedding dress or delicate heirloom garment.